The Era of Uncertainty: Global Investment Strategies for Inflation, Deflation, and the Middle Ground by François Trahan and Katherine Krantz (Wiley, 2011) is a thoughtful, thoroughly researched book. Its main thesis is that macro matters—a thesis that has been amply demonstrated in recent market movement. An investor can be right in his bottom-up analysis, but if he gets the macro picture wrong he’s most likely doomed: historically 71% of equity returns are explained by macro trends. The authors pay particular attention to the business cycle and how it can be understood using leading economic indicators—those with shorter lead times (e.g., Philly Fed index and ISM new orders/inventories ratio), those that are intermediate-term (e.g., consumer prices and emerging Asia equity markets), and those with longer lead times (e.g., changes in global short interest rates and the yield curve). For the investor it is critical to know where we are in the cycle, whether LEIs are accelerating or decelerating. Data from 1950 to 2009 make this clear. During this period annualized equity returns during the early expansionary phase were 34.5%, in late expansion 15.8%, in early contraction, 1.2%, and in late contraction -14.3%. The investor can further improve his returns by choosing those sectors that outperform the broader market in any given phase. After presenting a detailed account of inflation in the United States and a summary of some of the global economic tensions, the authors offer strategies for investing in both inflationary and deflationary environments complete with supporting charts and figures. The book concludes with some policy suggestions for a better economic future. The Era of Uncertainty is a model of strategic thinking and often imaginative research. It is well written, its charts are based on the proprietary work of Wolfe Trahan & Co., and its theses are thought-provoking. It’s one of those books to which I’m sure readers will return as events unfold down the road. Given the recent market volatility and the conflicting calls over whether we are carving out a short-term market bottom within an ongoing primary uptrend that began in 2009 or whether the market is rolling over, I was hesitant to review Mastering Market Timing: Using the Works of L. M. Lowry and R. D. Wyckoff to Identify Key Market Turning Points by Richard A. Dickson and Tracy L. Knudsen (FT Press, 2011). But then I decided that perhaps this is indeed the best time to share this work, written by two senior vice presidents at Lowry Research. First of all, it’s important to note that the authors focus on major market tops and bottoms. Although they accept the notion that market patterns are fractal in nature, they acknowledge that “the probabilities of wrong timing are likely greater on a short-term basis when brief periods of market volatility can upset the most thorough analysis.” (p. 193) They analyze the tops of the 1966-1969, 1970-1973, 1975-1976, 1980-1981, and 2003-2007 bull markets and the bottoms of the 1968-1970, 1973-1974, 1981-1982, 2000-2003, and 2007-2009 bear markets. Starting with Wyckoff’s models of market tops and market bottoms, they add Lowry’s proprietary indicators--the buying power and selling pressure indexes—to help quantify Wyckoff’s insights. 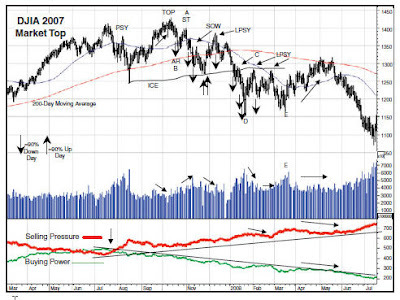 Their calculation takes into consideration daily up/down volume, total volume, points gained, and points lost. Add to the mix the concept of 90% up and down days, introduced by Paul Desmond (the current principal at Lowry Research), and you have the basic ingredients for making major market calls. By the way, I should note in passing as the authors do that a 90% up or down day must include both price and volume; that is, a 90% up day occurs when up volume is 90% or more of the total up and down volume and points gained is 90% or more of the total points gained plus points lost for the session. (p. 25) Desmond’s 2002 Dow Award-winning paper is available online. To give a sense of the authors’ work, here’s a marked-up chart of the final phase of the 2007 DJIA market top which includes Wyckoff, Lowry, and Desmond notations. In the second part of the book the authors introduce additional tools for identifying market tops and bottoms: point and figure charts, the NYSE advance-decline line, and the percentage of NYSE issues trading above their 30-week moving average. Mastering Market Timing will be valuable to anyone wanting to learn more about Wyckoff’s method. Since the Lowry indicators are proprietary, investors will have to be creative in coming up with something that approximates the buying power and selling pressure indexes. In the final analysis, will investors who read this book become better forecasters? I don’t know, but I consider it a boon to have so many charts of market turning points collected in one book. I know, I know, I’ve been a slouch. In my defense, I’m not the only one. Authors haven’t been prolific either, so I haven’t received a lot of books to review. Call it August. But slowly this blog will come back to life. Keep the faith. David F. DeRosa’s Options on Foreign Exchange, 3d ed. (Wiley, 2011) is a book for quants (or perhaps more precisely quantlets), which means that I’m ill equipped to review it in a meaningful way. Instead, I’ll simply outline its contents to give a heads up to anyone who is interested in trading forex options either speculatively or as a hedger and who doesn’t have an aversion to plowing through lots of equations, most of which are admittedly pretty straightforward. After some basics about the foreign exchange market and options, the author moves on to the meat of the book: valuation of European currency options, European currency option analytics, volatility, American exercise currency options, currency futures options, barrier and binary currency options, advanced option models, and non-barrier exotic currency options. There’s far more prose than math, and the prose is clear. And, with that, I’ll abruptly end this post with my sincere apologies to the author. He deserved much better. Options traders who have progressed beyond the basics would do well to read Dan Passarelli’s The Market Taker’s Edge: Insider Strategies from the Options Trading Floor (McGraw-Hill, 2011). Passarelli, a former market maker, shares a few war stories and explains how the stay-at-home trader (the potential “market taker”) can profit from learning what market makers actually do. The author highlights one difference between “them” and “us” with a story about interviewing applicants for a job to work as an options instructor. All of the applicants had to be current or former professional traders. “Upon arrival at the job interview, traders were given a test that included a few questions that required them to draw at-expiration diagrams for various options strategies. Unexpectedly, more than a fair share of market makers couldn’t complete that part of the test! … Why couldn’t many of the market makers draw these simple diagrams? They are not in the habit of doing so: they don’t need to do so.” (p. 26) They rarely have to deal with absolute, maximum risk since they don’t hold trades until expiration. By contrast, expiration graphs are drummed into the heads of retail traders, and it is only later that they learn that those gorgeous iron condor expiration graphs are a lot less impressive earlier in the trade. Passarelli spends time on topics most options books ignore, such as order entry (including middling the market), the usefulness (and most often uselessness) of stops on spreads, gamma scalping, synthetics, and position risk thresholds. Here are a couple of takeaways. The latest addition to the “little book big profits” series, Michael W. Covel’s The Little Book of Trading: Trend Following Strategy for Big Winnings (Wiley, 2011) looks at the financial world through the eyes of successful trend traders. In eleven chapters Covel shares insights and life stories from the principals of Sunrise Capital (Gary Davis, Jack Forrest, and Rick Slaughter), David Druz, Paul Mulvaney, Kevin Bruce, Larry Hite, David Harding, Bernard Drury, Justin Vandergrift, Eric Crittenden and Cole Wilcox, Michael Clarke, and Charles Faulkner. And although Ed Seykota doesn’t get his own chapter (except for the lyrics to “The Whipsaw Song”—if you’re not familiar with it, the YouTube video is available at www.seykota.com/tribe/essentials/index.htm), he is a frequent presence in the discussions of others. Covel, author of Trend Following, The Complete TurtleTrader, and the recent Trend Commandments, is an unabashed advocate of systematic long-term trend following trading. He doesn’t get into the nitty-gritty of how to develop a trend following system although he references the breakout system of the original turtles, a system I assume most trend traders these days have moved well beyond, and shares some general principles about devising a robust system. That’s okay because each trader really has to come up with his own system in which he believes wholeheartedly; there is no single template for trend trading. What Covel stresses throughout the book are the accompanying principles that make trend following viable: stick to your plan and manage your risk through diversification, stop placement, and position sizing. These are important principles for any kind of trading, but for trend following they are critical. After all, trend following has a low win percentage and is subject to long stretches of flat to negative performance. As a result it’s easy for a trader to start doubting his system. And for the same reason it’s lethal for a trader to risk too much on any one trade. Covel also rails against buy-and-hold investing and index funds. In the chapter entitled “Study Hard and Get an A+” he recounts a conversation that Justin Vandergrift had with a doctor who kept talking about index investing in the S&P 500. Successful trend following traders try to capture the outliers, the really big moves that more than compensate for the many small losses they take. This goal requires traders to have confidence in their systems and confidence in themselves. By introducing the reader to successful trend traders, Covel believes that some of their “magic” just might rub off.